I was introduced to Bug Village while strolling through the office minding my own business. Two coworkers were hovering over their Android devices discussing what appeared to be a living, colorful, miniature city. When I took a closer gander at the pint sized colony, it was indeed a small insectopia teaming with life. Bug Village is a quest filled town builder with a back yard, down to earth feel. The game centers around building colonies of small structures made from a variety of natural objects. The structures attract new insects to the village, and these new residents can gather resources to increase the size of, or customize the colony. The game is full of quests that give the player extra resources and experience for completing. The experience accumulates into levels that raise the maximum number of structures that can be built in the colony. +5 Customization - With a wide assortment of dwellings and decorations the user has plenty of objects available to make their very own unique playing experience. The dwellings that the player has access to can be upgraded to add a new visual spin on the structure, on top of adding additional functionality. The decorations come in a wide variety from fences, chairs, tables, lights to landscape changes like pots. With so many objects to choose from the visual combinations are endless. +4 User Interface - The game's User Interface reads like a mid-summer night's dream, guiding the player with ease through menus and options. The icons for each section are polished and well thought out. The sliding menus when selecting a structure, decoration, or food item, glide sleekly from selection to selection with ease. The game does an excellent job symbolizing the action that will be performed with each UI element. +4 Graphics - The graphics seemed to fit the game style and feel really well. The cartoon, bubbly characterization kept the game visually interesting and enchanting. With a wide assortment of structures, decorations, and food items, the game did an awesome job tyng all of these objects into the theme. The game ran smoothly on my Samsung Galaxy S with silky camera movements and animations. The game is based in real time, which can lead to a lot of waiting around for things to do or happen. The player can purchase or perform tasks for coins to make tasks instant but that pulls the player out of the game. The player can purchase acorns, the main currency of the game, to build objects but they are limited by what is currently unlocked. The player is not really able to get ingrained in the game due to the short play times. This issue is caused by the slow and sometimes painful progression of the real time system. The issue is further compounded by the way structures and decorations are unlocked through quests. The player can unlock the structures and decorations by using coins, but I think this destroys the gaming experience. Bug Village was a lot of fun to play. With so many objects available to customize my micro village I will continue to play for some time. 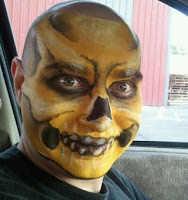 The game is great for people who do not have a lot of time to spend playing a game in long spurts. I feel this review is a little too generous. I've played this game long enough to get to level 15. I'm on a Windows Phone. However, I know my experience is very similar to others who have played the Android version. The Xbox LIVE implementation of Bug Village leaves much to be desired. 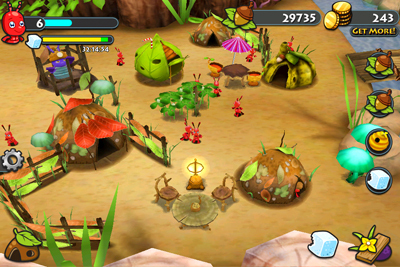 It's lacking many of the buildings and bug types that are available to the Android version. As I progress through levels, there's nothing compelling me to continue (other than achievements). Each level presents more of the same buildings to build. Due to time limiting mechanics, I can't spend time customizing my village when I actually have the time free to do it. Bug Village is free to play. It has to make its money somewhere. However, its pricing on micro payments feels way off. For the same cost of buying another full Xbox LIVE title on the Windows Phone, the same amount will merely buy a new bug home that produces the same bugs as your other houses. The developers implemented a food system. You feed your bugs and they will work for x amount of time. This time is capped at 36 hours. If you let the time run out, your bugs will stop working. The worst part is you will lose the xp and resources that your bugs had been working on gathering - even if they had completed their task before the food ran out. The devs added a way to resume your reward collection through micro payments but this becomes pretty expensive when you have a lot of resource piles that need to be reactivated - nearly the cost of another phone game or potentially more. 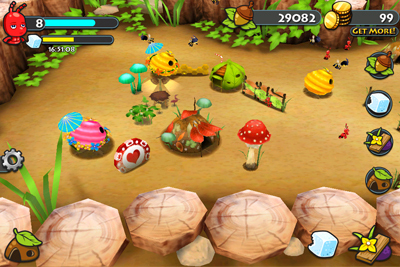 In Bug Village, you purchase your own resource piles for your bugs to gather from. These are bought using either acorns which are gathered through gameplay or coins which are purchased in micro payments. Sadly, there is no way to tell what a specific resource pile will provide you by way of tasks until you actually build it. I purchased a flower resource with micro payments (for 160 Microsoft points - roughly $2) and was severely disappointed when the timing for tasks the flower provided were totally out of whack with the timing on my other resources. It made my newly purchased flower fairly useless. More often than not, you enter the game begging it for more but after scouring the village for some time, you realize you really have nothing to do. Quests dry out pretty fast. Sometimes you have bad bugs that you need to kick out of the village but in my game, the bugs no longer turn up (with the exception of the ladybug). Overall, I was hoping this would be a game that would draw me in and keep me coming back to it. The truth is once you've slogged your way through the first village levels, you begin to realize the later levels hold none of the excitement or charm you were hoping for. Pros: It's free for the basics. Cons: The devs have tried to monetize everything in the game. Howver, even if you didn't have to pay for micro payment features, they don't necessarily make the game more enjoyable. Ben, thanks for the heads up on the differences between versions. And thanks for sharing your opinions on the game with us. The reviewer, Tron, played it on an Android. I really wish I had enough money for a smart phone plan. THen I could try android.